Andrea, the cub's fur was quite rough! Paradise Valley Springs is a beautifully presented New Zealand Trout, Bird and Wildlife park, along with a pride of African Lions. Visitors can interact with a variety of wildlife that is found wild around New Zealand. Animals such as Deer, Pigs, Thar and Wallabies may be hand fed. Rainbow and Brown Trout can be spotted in crystal-clear pools and wild in the Ngongotaha Stream that winds through the park. Farm animals include Alpacas, Goats and Sheep to name a few. Also to be seen, waterfowl & native alpine parrots the Kea. Walking on the elevated rain forest treetops walkway, hidden six metres high amongst bush and huge native trees is a great experience. It does sound like a wonderful place. You sure get to meet fantastic animals! Sounds like a wonderful place, neat shot! Wow, what an experience that must be. 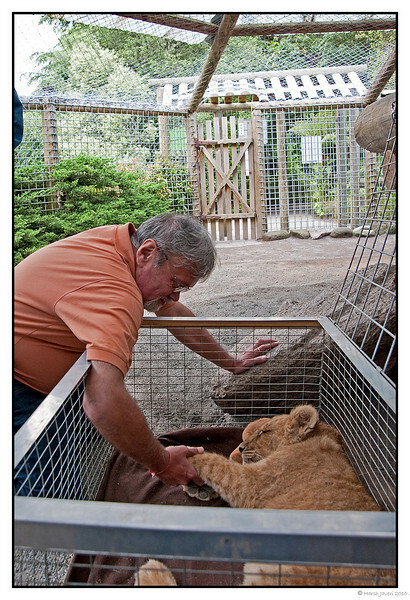 What did the lion cub's fur feel like? Soft? Bristly? I can't really imagine. fantastic! what a neat experience! What a brave man you are!! !